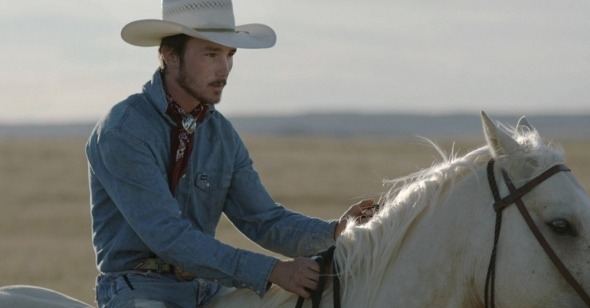 At one point in The Rider, Chloé Zhao’s resplendent documentary-inflected drama about a rodeo star slowly coming to terms with a career-ending injury, protagonist Brady Blackburn breaks into tears in his car after visiting his tetraplegic friend Lane Scott, a (much more severely) incapacitated ex-rodeo champion. Zhao has said that 20-year-old Brady Jandreau—who, along with Lane and all the other actors in the film, plays an ever-so-slight variation of himself—had not cried in seven years. Only under the pretext of performance did Brady allow himself to succumb, recalling events similar to those dramatized in the film. The Rider derives its extraordinary emotional realism from moments like these, in which the inner lives of its (non-) actors reveal themselves in the refuge of fiction. Zhao polished this approach in her debut feature, Songs My Brothers Taught Me (2015), a poignant drama about a pair of young Lakota siblings on the Pine Ridge Indian Reservation in South Dakota. In one of that film’s most moving scenes, twelve-year-old protagonist Jashaun tearfully sifts through the debris of her father’s house, destroyed in a fire that also took his life. Zhao improvised that shot when Jashaun’s actual house burned down unexpectedly during production (though the nature of her father’s death was scripted), orchestrating a collision of fact and fiction to produce a deeply affecting, yet unaffected, display of emotion. Songs offered a revelatory portrait of modern Native American life in Pine Ridge; The Rider burrows even further, into a niche, fast-fading world within the reservation: the rodeo. The literalness of the film’s title appropriately captures the ethos of this culture, where things are defined by singular, God-given purposes: horses are meant to stroll through the prairie, and cowboys are meant to ride. It’s unsurprising, then, that when Brady suffers a nearly fatal brain injury during a rodeo and is advised to never ride again, his only frame of reference is equine. “I got hurt like Apollo did,” he says to his autistic 14-year-old sister Lilly later in the film, after somberly dispatching a wounded colt. “But I’m a person, so I gotta live.” It’s the sort of metaphor that would seem cloying, were it not for the disarming sincerity with which Brady and Lilly surrender themselves to Zhao’s intimate camera. Brady’s accident plunges him into an existential uncertainty—a tortured oscillation between denial and resignation—that is par for the course for the film’s sports-drama-like template of a luminous career cut short. However, with an intuitive eye for the mechanics of community, Zhao traces the ripples of Brady’s crisis across his interactions with friends and family, revealing a collective, confused grappling with his plight: nobody knows what a cowboy should do when he can’t ride anymore. Brady’s alcoholic father chides him for his intractability—which takes on suicidal dimensions when he continues to ride despite being warned of dire medical consequences—but is also the sort to tell his son to grit his teeth and “cowboy up.” Lane urges him (painstakingly, using rudimentary sign language) to never give up, even as he embodies a cautionary tale for the consequences of his own advice. Brady’s fellow bronc-riders remind him that the cowboy credo is to “ride through the pain,” while Lilly, the most convincing of them all, simply asks him to not die. By contrasting the windswept fields and endless horizons of the Badlands with the closed, fluorescent-lit Walmart where Brady grudgingly takes up a job, the film reinforces the stakes of his dilemma: life on horseback ultimately might kill Brady, but it is essential for his spiritual survival. Foregrounding the quasi-religious connection that the cowboys share with their environment—the hushed reverence in their faces even as they swap tough-guy stories of rodeo wounds around a fire, or the whispered, intuitive magic with which Brady breaks a wild young horse—Zhao elevates The Rider beyond the ethnographic to something cosmic. Framed against Joshua James Richards’s grand, sunset-soaked vistas of the prairie, Brady’s struggle becomes, like many cinematic renditions of the American West before it, the struggle of a people and their way of life in a rapidly changing world. I talked to Chloé Zhao about finding emotional truth in fiction, shooting macho cowboys with a female gaze, and the importance of hopeful filmmaking in troubled political times. Reverse Shot: I read that you began shooting Songs My Brothers Taught Me without a script when the funding for Lee, which was supposed to be your debut, fell through. You said that at the time, truth was “all we could afford.” Did you always have an interest in docufiction or did that approach arise from production constraints? Chloé Zhao: I’m a little wary of the term docufiction for this film. I appreciate people feeling like it’s so real that it’s almost like a documentary. It’s heavily based on Brady's life and it’s played by Brady. But it is actually very stylized—it’s fiction, they’re acting. Almost everything is staged. I would say that about 15 percent of the film might be improvised, but everything else follows the script. I really think truth and poetry are the same thing, a lot of times. I think these days, in traditional documentary filmmaking, people are starting to explore more poetry. Films like The Act of Killing, Heaven Knows What, Tangerine are working with the fiction form but they’re trying to include fact. Because I think both these things are needed. One, to give you the facts, and the other, to give you the emotional truth of moments that cannot just be done with point-and-shoot. I started with an interest in fiction; I was never interested in making documentaries . . . because it’s really hard to make documentaries. It takes a lot of guts. I was trained in the fiction form. But like you said, it was very much out of necessity that I started working this way. I also think that there is a rise of filmmakers who make films like this. It’s almost like a reaction to how the industry has been—who gets to make films, who gets financing, whose story gets financed. There’s a rebellion against that. If you’re not gonna give me the money, maybe I’ll make it cheap. I won’t cast that person I’ll cast this authentic person instead. RS: Was Songs more fictionalized than The Rider? Or did you take the same approach for both of them? CZ: I started with thirty drafts of a script for Songs, and then increasingly based it on the people I met in real life. And then when the money fell through, we still kept the main story, took the people we knew we could put in the film, and dramatized something based on who they are. Which is very similar to The Rider. But I learned from every mistake I made on Songs, so The Rider hopefully feels a bit more seamless. RS: Songs has more aspects of what you’d expect from a traditional narrative drama, like a romantic subplot. The Rider seems to stick very closely to Brady and his story. CZ: That’s one of the mistakes I learned from in Songs. I strayed away too much. But also, Songs was so much about a place, whereas The Rider is about one person. Because Songs touched on such a broad theme, I was hungry to go back to the same place but go deeper—one family, one individual. The Rider also had a lower budget and less people in the crew than Songs. So we knew our limitations. RS: Did you work with a script on the The Rider? CZ: Yes, 55 pages. So more of a skeleton of a script. RS: How much of that was collaborative? Did you work with your actor-protagonists to come up with the dialogue and situations? CZ: Yes. I first talked to Brady, and he started telling me what his recovery was like in the first couple months—because it was very fresh. He got hurt in April, I started writing the script in August; we shot in September. It was only four months. He was telling me everything that had happened, including Apollo’s death, his first time riding Gus. I took notes, I went home, I came up with a script. And then when I went back, I usually gave them the scene, and let them rework the dialogue. RS: Are there any specific instances when Brady surprised you by changing something? My job is to make sure that it works in the editing room. When I see them having an exchange, I’m editing in my own head, thinking about how that scene could go, what are the key lines that narratively make sense. I’m writing on the spot. Then [I] cut, and tell them: Okay, so now you're going to say this again, and then say that and say that. There are a lot of scenes that are done that way, where I didn’t even bother to write anything, because I thought, nothing I write will be as good as what he’s going to say. RS: You grew up in Beijing and London before coming to the States for college. But both your films have been about “quintessential American” stories, as people say, and are set in a part of America that is sort of insulated from the rest of the world. Was it challenging to film these communities as an outsider or did it perhaps give you a unique perspective? CZ: Both. It wasn’t as challenging as most people think. I think that’s partly because I, like you, am a woman of color. I’m not a big, tall, white guy. You know, if you go to the reservation, people will embrace you in a heartbeat. And with the cowboys... I got to know them before I thought of them as macho. I’m from China, so I didn’t grow up watching westerns. I didn’t have any preconceived notions of how an American cowboy should act. I treated them no different from the kids in my first film. They’re all Lakotas and they live on the reservation. That’s it! That was easy to do as an outsider. I was a blank canvas. I didn’t judge. I do think the challenge is to not judge. It’s less about race; it’s more about city vs. country. It’s hard for me to not judge what I think would be better for them. Many people make that mistake. When I’m writing the story, it’s very important for me to show life as it is, but also honor why these people choose to stay. And it’s not just the lack of opportunity. RS: I’m thinking of that classroom scene in Songs, where the teacher asks the students what they want to be when they grow up, and most of them just want to be a wrestler or own a ranch. But by the end of both your films, the characters accept their desire to be rooted to their family and home, but it’s not a grudging resignation. Even when Brady goes to the rodeo at the end of the The Rider and then backs out at the last minute, you really do film it in a way that feels celebratory. How did you conceptualize those concluding scenes? CZ: As I said, it’s very important to me that the message is not that it is hopeless there and they should leave. Or something sensational, like he’s going to die. Because life goes on after a rodeo. And sometimes, as a culture, we overly sensationalize the big hero, the big win. I’m very interested in what happens after the show is over. You go home and you still go on. That’s very much the frontier spirit. It’s a time when this country is under a lot of criticism, rightly so, and I’ve found my place in portraying certain things, but showing them to you in a way that you get to make your own judgment. And so far, I have been very moved that people want to see the good of this country. I’ve played in festivals filled with very liberal democrats, and I saw them relate to images that look like they’ve come out of Trump’s America. I was very moved because we did make an effort, both in casting and [choosing] the type of stories we wanted to tell, to show hope. If you just show life, as it is, you’d be surprised. I’ve been depressed, with what’s going on in the world, and as a storyteller, I don’t need to contribute to that even more. It’s very easy to go out there a make a film that’s harsh and issue-driven. And I get criticized for not addressing the issues. Even for my first film, people said to me, there are so many issues faced by Native Americans, why are you telling a story about a teenager messing around? Because they’re human beings! They’re not issues. I think issue films are quite comfortable. Because, when they're made badly, they take a side. But it is so important for a storyteller to not resort to that easy thing. It’s [important] to stick to the grey area. That’s where the humanity is. RS: You get very close and personal with these characters. They’re often putting up their flaws or insecurities onscreen, and acting for a very close camera. It’s remarkable that you achieved that with people who’d never acted before. How did you work with them? CZ: A few things. First, you have know them well and write to honor that. If your script is off, then you’re forcing them to do cheap acting tricks, and that’s not going to work. Doesn’t matter how good you are, or how much you want them to do method acting. If something is not working, I quickly rewrite it. The second thing is trust. They have to trust you. You have to be a good listener to really know what makes them sad or what makes them happy. With Lilly, I knew that if she was a little upset, she would do the opposite of what I would ask her to do. So I would tell her the opposite of what I wanted. You have to spend time with people and get to know them. Even if I’m working with professional actors in the future, whatever that means, I will do the same thing. And the last thing is to protect them. Because once you gain their trust, you have so much access. I was constantly asking myself, both in the editing room and while shooting, am I pushing too hard? Do they even know what they’re showing? Are they going to feel comfortable? And if you don’t protect them, they’ll probably find out. You have to earn their respect and trust. RS: I saw Western and Zamain the same week as The Rider, and I was thinking about what a female gaze reveals about masculinity. As a woman director, was there something you could access about these male protagonists that male directors perhaps cannot? RS: Is it easier for you to honor that as a woman? CZ: I think it’s easier for them, because they feel like they can be more vulnerable with me than with a big guy coming in. I think it’s important for me to be in the car with Brady, without anybody else, to get him to cry.